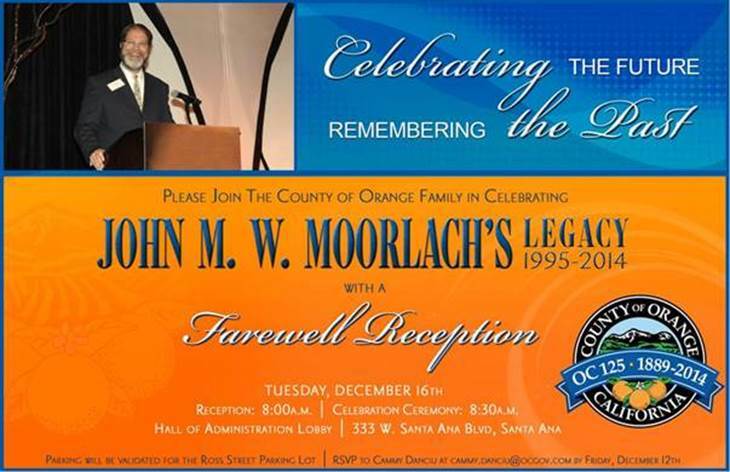 The Voice of OC’s new columnist was the focus of MOORLACH UPDATE — Post-Mortem — November 7, 2014 (see MOORLACH UPDATE — Post-Mortem — November 7, 2014 and http://www.voiceofoc.org/community_editorial_board/article_4970cbdc-6697-11e4-aa28-2bc4d1cddda4.html). It generated a fun interview that resulted in the column below. Supervisor John Moorlach never put out press releases during his term in office, rather he sends out what he calls “Moorlach Updates”. Anytime he’s written about in the press, he sends one of these with a link to the column and his own take on the piece. I don’t know how many peeps are on his email blast list, but I am, and more than a few times, these updates have included things I’ve written about him. Needless to say we’ve had our good and bad days. That was a nice compliment, but what really shocked me was all the links he included, about 40, to articles Id’ written about him- and he hinted there were more. Now in my biz, politicians are pretty much low hanging fruit- but had I really picked at his tree that much? Moorlach never shied away from the press or my tough questions, so I figured I’d call him this week. Seems only fitting I’d write one last column as he closes this chapter. My relationship with him is complicated. We met when I was serving as chair for the Project Advisory Committee of the Santa Ana Hts Redevelopment agency. Frustrated dealing with outgoing Supervisor Jim Silva, I reached out to then candidate Moorlach. He was eager to understand redevelopment issues, projects and stumbling blocks I’d encountered. I will say once he took office, he got projects underway. I liked him then and I still do, though we’ve had to sometimes agree to disagree when it comes to his politics. As expected, these days he’s in a reflective mood. “I’m sprinting to the end and there is still l plenty to do. It’s an 80 hour a week commitment,” he said of his last days as a county supervisor. In addition to packing his office, he likens this time to that of running the last lap of a race, and looking forward to raising his hands as he hits the finish line. As he exits, he’s starting to get offers from non-profits, colleges, and CPA firms, though he’s made no decision on what road he’ll go down next. I asked if the job of supervisor was what he’d thought it would be, and how he’s changed. As an accountant he’s an analytical personality. As a CPA he was used to getting things to done and put to bed. “I took that here. I found myself willing to take on big projects. Some of them were controversial and some of my counterparts were interested in being non- controversial,’ he said. Moorlach’s had a long history with the county government. He’s largely credited with predicting the 1994 bankruptcy, which is now coming on its 20th anniversary. In every job there are wins and regrets. He lists helping to engineer the structure of the early pre-payment to the pension system while still Treasurer-Tax Collector – which he says continues to save the county about $20 million a year in savings- in his win column. And before he was sworn in as Supervisor, he worked on a committee with Orange County Employees Association General Manager Nick Berardino, to reduce the county’s retiree medical unfunded liability, which he estimates reduced the county’s liability by a billion dollars – another win. Though Moorlach says he doesn’t have a lot of regrets, there’s one still on his mind. “That we did not prevail in litigation to unwind the retroactive pension benefits. We were told from the get go that judges may not help you even if you are right,” He says. The fact that judges get pensions from the state would make this a rough road and he knew it. “For the Supreme Court to not even take the case, that was a disappointment. That’s where we expected the scholarship to be,” he says. Moorlach still feels had he prevailed here bankruptcies in Stockton and San Beradino would have never occurred. “There are some powers you can’t overcome. I guess that’s a regret.” He said. And even though they’ve fought toe to toe on this and other issues, Moorlach said he believes he and Berardino share a “mutual respect”. This past election season, Moorlach also made a short-lived run for Congress. I asked him why he threw in the towel so early in his campaign. He said two things happened that changed his focus. His father-in-law passed away, and his son-in-law took a job in Milwaukee which meant his daughter and granddaughter would be moving away. With his eye on family issues and off the race, Moorlach said State Senator Mimi Walters gained momentum for her congressional bid. By the time he re-focused he’d lost too much ground. The smart move was to opt out. So as his term as a county supervisor ends, is he over politics? “I don’t have the answer to that – I think about it once or twice every second." “Do I run for Mimi’s seat? In two years do I run for (Congressman) Dana Rohrabacher’s seat? Or do I watch (incoming County Supervisor) Michelle Steel do that and come back and run for Supervisor?” he questioned jokingly. While we were having some fun playing “what if”, I suggested Moorlach ditch the political game, come over to the dark side and write political commentary- maybe even for the Voice of OC? He chuckled and I got the feeling he might be crazy enough to actually take me up on it. After all, writing about politics is a heck of a lot more fun than being in it. The campaign went national on this day in history. Earl C. Gottschalk, Jr., reporter for The Wall Street Journal, published “Derivatives Roil California Political Race” on page C1 (a very big deal). To make it to the Wall Street Journal was unbelievable. What more was there to do in life? This article broke interesting news that the local papers couldn’t get their arms around. One small fact it did not mention is that you utilize a reverse repurchase agreement for 90 days. To elaborate, Mr. Citron would use a 90-day reverse-repurchase agreement at 2 percent to purchase a four-year Fannie Mae note paying 4 percent. The problem ahead was that short term rates were rising to an amount higher than 4 percent. Once that happens you implode. You are paying out more interest than you are taking in. Otherwise the article was phenomenal. It even addressed “marking-to-market,” something GASB 31 addressed a couple of years later as a result of this campaign (I call it my own personal GASB statement J.) It was unfortunate that the Wall Street Journal wasn’t required reading for everyone in Orange County during the campaign. By placing highly leveraged investment bets, Robert L. Citron, the county’s veteran treasurer, has generated returns that he says are some of the nation’s highest for county money managers. In 1993, he says, the money he manages for Orange County and 186 other California municipalities, school districts and governmental units earned 8.5%. But more recently, he concedes, the value of his portfolio has been hit by rising interest rates, forcing him to come up with $140 million to meet “collateral calls” from brokers who lent him money. Political opponents see it differently. Led by his challenger for the treasurer’s job in a June election, they charge that Mr. Citron’s strategies are way too risky and that the recent rise in interest rates has lost taxpayers a bundle. In a reverse-repurchase agreement, a borrower delivers securities to financial institutions in return for cash, with the understanding he later will buy them back at a higher price. Meantime, the borrower invests the cash, hoping to get a higher rate than he has to pay under the terms of the reverse-repurchase agreement. In effect, it is a way to pump up the income generated by a bond portfolio by purchasing additional securities with borrowed funds. Mr. Citron says he has been investing part of this $19.5 billion pool in two-year to five-year government agency securities issued by the Federal National Mortgage Association and Federal Home Loan Bank system, which pay higher yields than comparable Treasury securities. In addition, Mr. Citron says, some 20% of the $19.5 billion is invested in derivatives, financial agreements whose returns are linked to, or derived from, the performance of some underlying asset, such as bonds, currencies and commodities. It has been difficult for bond professionals and other municipal treasurers to comment directly on Mr. Citron’s approach because he doesn’t make his investment portfolio public. However, Mr. Citron promises to disclose the details to Mr. Moorlach on Monday. Unlike mutual funds, pension funds, hedge funds and most other money managers, who have to recognize losses and gains in their portfolios as market prices move, Mr. Citron says he doesn’t have to mark his portfolio to market values. Mr. Moorlach says he isn’t impressed by Mr. Citron’s comment. “Mutual funds and everyone else marks to market, and if I’m county treasurer, I will mark investments to market,” Mr. Moorlach says. Not marking to market is just a way of concealing losses, he charges. In the past, some cities and counties in various parts of the U.S. have run into trouble by using reverse-repurchase strategies. Similar strategies caused the collapse of numerous savings-and-loan institutions in the 1980s.